A look at some more of the frontmen blazing a trail in the non-league game. Considering the popularity of, and response to, the first NL Scout article, it is only right that I do a new one! The response to that first article was incredible, with fans and clubs themselves getting in touch recommending players, or demanding to know how I had overlooked a particular player. The answer, quite honestly, is that it is always a difficult task to get these sort of things right, and the likelihood is that someone will be unhappy that a certain player was not included. I hope to address a few of those issues here! First, a quick look at the strikers featured in the first article. Of those I wrote about, two ended up moving into the league during the 2012 January transfer window, and a third had numerous offers for his services rejected, while another is facing months on the sidelines while he tries to sort out his eligibility. Kwesi Appiah moved from Margate to Crystal Palace on the final day of the window. He has yet to score for his new club, but has only made a handful of appearances. Jason Prior, who was on trial at Newcastle United, signed for League Two side AFC Wimbledon from Bognor Regis Town, but has yet to make an impact at Kingsmeadow. Jamie Vardy was the subject of several bids from clubs as high up as the Championship, with offers reported to be in the region of £1million. As for Jamille Matt, he has been branded an “illegal immigrant” following a recent call up to the England C squad. Born in Jamaica, Matt has lived in England since he was seven, and even went to University in this country. He has been put on leave by Kidderminster Harriers, and could be out of action for between two and six months according to the club. Here’s hoping he can sort things out and get his promising career back on track. Anyway, let’s have a look at some more of the players you should be watching out for. 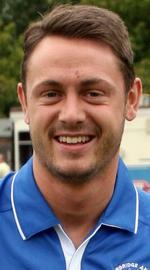 Twenty-three year old Tarpey has been at The Beveree for three seasons, making eighty appearances for the club. He started out on the right of midfield, but since he has moved upfront, the goals have started to flow. He has 24 in all competitions so far this season, and the skilful striker is a firm favourite with Beavers fans. His tireless running, allied with a great left foot make him a prolific striker in the Conference South. He scores all kinds of goals; from tap-ins to great lobs and individual goals. He isn’t the biggest, so is obviously not the best in the air, but when partnered by a traditional “big man” he is in his element. If the club can keep hold of him, then even if relegation does happen this season, an immediate return could be on the cards. He recently scored the second goal in a 2-0 win against Wealdstone in the Middlesex Senior Cup Final. Jamie Vardy may be the one who has been garnering all the headlines and big money offers this season, but it is Liam Hearn of Grimsby Town that has been the leading scorer in the Conference for most of the season. The 26 year old has scored 26 goals in the league this season in a Mariners’ side that are just outside the playoff places in the Conference National. There are clubs circling the striker, though, and a move may be on the cards this summer. Peterborough United were one club considering an offer in the winter transfer window, and considering their track record with bringing strikers out of non-league football, that would be a potentially great move for Hearn. 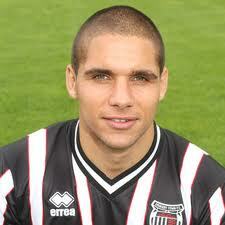 He hasn’t played in the Football League as yet, having spent all his career in the non-league pyramid. He made his name at Alfreton Town, where he netted nearly fifty goals in three seasons before joining Grimsby in summer 2011. A name to keep an eye on this summer, that’s for sure. Collin has made a name for himself in the Conference South, both with his current club, and his former team Dover Athletic. He is approaching a half century of league goals for Angels in only his second season at the club, and scored four times in a 5-1 win over Eastbourne earlier this season. Born in Kent, the 24 year old former England U18 international has spent all his career in The Garden Of England. 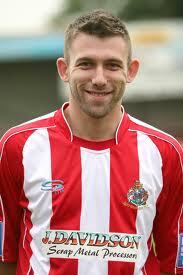 He started out at Gillingham, and scored on his debut for the club in the Football League Trophy. However, he found his opportunities limited at Priestfield, and he was released. He linked up with former manager Andy Hessenthaler at Dover Athletic, and he soon started finding the net on a regular basis. He has had a one in two scoring record ever since, and is sure to be on plenty of Football League clubs’ radars this summer. In fact he was the subject of at least one bid from a League One club in January, and the chairman’s phone is likely to be ringing off the hook again during the summer. It’s hard to believe that Sole was frozen out at Kingfield, and farmed out on loan to Basingstoke earlier this season, but that’s what happened. It ended up rejuvenating his career, though, as he got back into Woking’s first team upon returning, and has not looked back since, equalling the club record of scoring in eight consecutive matches. He has netted twelve times in those eight games, a run that has propelled him up the scoring charts in Conference South. A Woking academy graduate and former England C international, 24 year old Sole has been Woking’s top scorer on numerous occasions, and boasts a better than one in two scoring record. 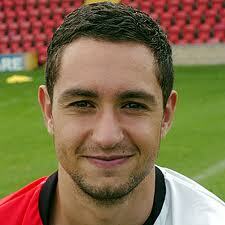 He has also had spells at Dorchester and Havant & Waterlooville, but it is at Woking where he has been at his best. At time of writing, he is sure to win a title medal, as Woking are one win away from securing the Conference South title. Twenty two year old Kabba is starting to find the net on a regular basis for Weston. With fifteen goals to his name this season, he is the joint third highest scorer in Conference South this season. He came through the Bristol Rovers academy before moving on to Almondsbury Town and then Weston. A quick striker with an eye for a spectacular goal, he is sure to start alerting clubs higher up the leagues in the coming seasons if he continues his good progress. The twenty six year old has had a phenomenal season, netting a staggering forty two league goals for mid table Alty, five of which have been penalties. He has been at the club since June 2010, and has been scoring ever since. He was top scorer in his debut season, netting nineteen times in the league, and has followed that up with this season’s amazing tally. He started the season by scoring 33 goals in the first 28 games, including ten successive scoring appearances, a club record. He is a product of the Leeds United youth system, but a badly broken leg scuppered his progress, and he ended up travelling around non-league before finding his happy home at Moss Lane. He is sure to be on the radar of clubs slightly higher up the system, certainly as far up as League One, and it will be interesting to see how he fares if given another opportunity in the League. Described as a wonderkid in his early years, Spencer came through the ranks at Oldham Athletic before being snapped up by Everton as a seventeen year old for £220,000. He never made the first team at Goodison Park, and was loaned out to Yeovil and Macclesfield before being released in 2009. He knocked around the lower leagues with Rochdale, Southend and Lincoln City, and was released by Lincoln when they were relegated from League Two. He wound up at Hyde, and has finally started realising his potential. He scored in his first nine matches, getting thirteen goals in the process. He also netted all four goals in a 4-0 win away at Corby Town, prompting the description that he is an “undoubted star”. He has hit thirty goals in as many league games this season, as Hyde look to win the Conference North title. I would be surprised to see him move on, especially if he gains promotion with Hyde, as he is obviously enjoying his football and is scoring regualarly. He is sure to be a hit in the Conference next season should he get there with Hyde. Posted on April 10, 2012, in UTL Archive and tagged Damian Reeves, Dave Tarpey, Francis Collin, Giuseppe Sole, Liam Hearn, Non-League Scout, Sahr Kabba, Scott Spencer. Bookmark the permalink. 6 Comments. 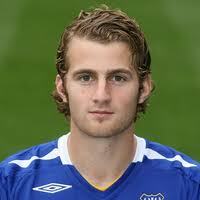 David Tarpey is 23 years old and has scored 24 goals in all competitions. Amended, thanks for pointing out the age. I had written his bit a little while ago, and hadn’t altered it to reflect his goals again. I know I’m biased – but I think our very own Tony Stokes could well be worth a mention; currently has 31 in 34 starts this season (missing the first 7 games through injury) and has an overall league record of 54 in 88 for us! Thanks for the suggestion Miki. Sounds like you’ve got a good one there! Will you hold onto him? Missed mentioning Rhys Griffiths, prolific in the Welsh leagues, snapped up by Plymouth Argyle for his first taste of league football at the age of 32. I try and keep it to the younger end of the market when doing these articles.